Hottest Tiny House Market in America! Opportunity knocks. 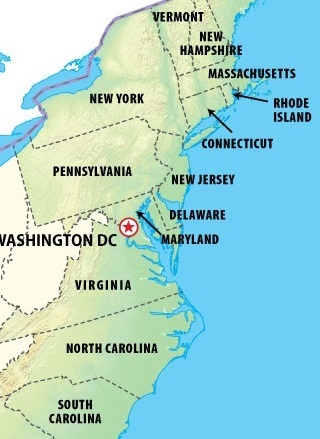 41,473,985 people live in the Mid-Atlantic. The wealthiest and most heavily populated region in the nation is also among the most underserved by the tiny house industry. Tiny House exhibitors are the stars of our shows. If you have a tiny house, shell or skoolie that you would like to bring to our shows, please contact us! Please register below. Contact us if you want to pay by check. One exhibit space of approximately 10' x 10' (Virginia) or 12' x 12' (Maryland). See Terms and Conditions below for more specific information. One exhibit space of approximately 10' x 10' (Virginia) or 12' x 12' (Maryland) located at the end of a row with more access/frontage. See Terms and Conditions below for more specific information. Price is for one oversized exhibit space in a premium location (20' x 20' in Virginia; 12' x 24' in Maryland). See Terms and Conditions for more specific information. By clicking the box below, you acknowledge receipt of and your willingness to comply with the terms and conditions for exhibiting at this expo. A copy of these Terms and Conditions will be furnished to you via email for future reference. Booths may not be re-sold, transferred or assigned. Only the company completing this form may show the products and services it sells in the booth. You are responsible for Your booth, the material that You ship to and from the Show and the material in Your booth. Consequently, You should have appropriate insurance. The producer of the show, Side Alpha Holdings, LLC (“Show”), reserves the right to reject, eject or prohibit any exhibit in whole or in part, with or without giving cause. Show liability for rejection without giving cause shall be limited to a refund to You of the amount of fees unearned at the time of ejection. However, if You or Your exhibit is ejected for violation of these rules or for any other stated reason (with cause), no return of fees will be made. You are expressly forbidden from dismantling or packing any portion of Your exhibit booth prior to the official Show closing. Violations may result in disqualification from participation in future shows. If You do not pay Your invoice in full by the due date, You will be barred from entry and your Show space may be reassigned. Agreements without payment will not be processed, without exception. Methods of payment include Visa, MasterCard, Discover or American Express. Payments, including deposits, are non-refundable and non-creditable. Additional booth space will be sold at the market price in effect at the time of purchase. Show reserves the right to treat Your downsizing of booth space as a cancellation of the original space and purchase of new booth space. You may be required to move to a new location if You request a downsizing of space. Any reduction in Your booth space size may result in a loss of any volume-based discounts previously applied. Additional upcharges for options are listed and described on Show’s website. These fees will be added to Your charges when Your booth(s) is/are assigned. There will be no refund should You cancel Your space reservation for the Show or fail to attend/participate. Show floor plans will be made available to You and other exhibitors for booth space selection on a first-come, first-served basis as determined by receipt of full payment. No booth space will be reserved without an applicable payment. You agree that Show in its sole discretion has the final say concerning the layout of the show floor. You also agree that Show has the right to relocate exhibitors for any reason. Your listing(s) will appear in the show directory based on information you furnish now and in the future. The deadline for information and image(s) (company logo) is 30 days before the Event. Show is not responsible for errors or omissions in directory listings (no refunds or credits will be issued). Federal, State and Local laws must be strictly observed. Cloth decorations must be flameproof. Wiring must comply with fire marshal’s and underwriter’s rules. Smoking inside buildings and other exhibits is forbidden. Crowding will be restricted. Exhibits cannot block aisles or fire exits. All visual and audio recording rights before, during and after the show are reserved to Show or its affiliates. Any displayed item within Your booth may be recorded by Show or its affiliates for future use. No recording of booths, other than Your own, is permitted at any time. Your booth space, exhibit and personnel may be recorded by Show or its affiliates before, during or after the open hours of the Show for any Show or its affiliates uses. Without express written approval from Show, You may not display products/services and/or other advertising material in areas outside Your booth space such as, but not limited to, parking lots, hotel lobbies, lounges, corridors, sleeping rooms, etc. You may not conduct unauthorized facility tours. You also agree not to operate hospitality suites, or hold any other functions open to attendees, during Show hours or when Show-sponsored activities are being held. Only exhibitors may host a hospitality function. All requests for a hospitality suite or public function space must be made through Show. By exhibiting at the Show, You grant to Show or its affiliates a fully paid, perpetual non-exclusive license to use, display and reproduce Your name, trade names and product names in any directory (print, electronic or other media) listing Your Company at the Show and to use such name in Show or its affiliates promotional materials. Show shall not be liable for any errors in any listing or descriptions, or for omitting You from the Show program or other lists or materials. Show management reserves the right to edit and/or delete Show program submissions. Companies not current with payment will not be included in the Show program. Each booth will be furnished with one 2’ x 6’ or larger folding table and 2 folding chairs and pipe and drape. Electricity is available at an extra cost. Wi-fi will be furnished at no charge. Merchandise, signs, decorations or display fixtures shall not be pasted, taped, nailed or tacked to walls or drapes, etc. No Exhibit, merchandise or equipment shall be left in any aisle, but shall be confined to Exhibit Space. No signs or advertising devices shall be displayed outside Exhibit Space or projecting beyond limits of Exhibit Space as to interfere with any neighboring Exhibit. Vertical space directly above the Exhibit space may be used within reason subject to the final approval of Show. You expressly assume all risks associated with, resulting from or arising in connection with Your participation at the Show, including, without limitation, all risks of theft, loss, harm, damage or injury to the person (including death), property, business or profits of exhibitor, whether caused by negligence, intentional act, accident, act of God or otherwise. You have sole responsibility for Your property or any theft, damage or other loss to such property (regardless of whether stored in any courtesy storage area), you waive any subrogation claims that Your insurer may have. Neither Show nor the exhibit facility accepts responsibility, nor is a bailment created for property delivered by or to You. Neither Show nor the exhibit facility shall be liable for, and You hereby release all of them from and covenants not to sue any of them with respect to any and all risks, losses, damages and liabilities described in this paragraph. You shall indemnify, defend (with legal counsel satisfactory to Show), and hold Show, its affiliates, and the exhibit facility harmless from any claims, demands, suits, liabilities, damages, losses, costs, reasonable attorneys’ fees and expenses which result from, or arise out of or in connection with: (a) Your participation or presence at the Show; (b) any breach by You of any agreements, covenants, promises or other obligations under this contract; (c) any matter for which You are otherwise responsible under the terms of this contract; (d) any violation or infringement (or claim of violation or infringement) of any law or ordinance or the rights of any party under any patent, copyright, trademark, trade secret, or other proprietary right; (e) any libel, slander, defamation or similar claims resulting from Your actions; (f) harm or injury (including death) to You; and (g) loss of or damage to Your property, Your business, or Your profits, whether caused by negligence, intentional act, accident, act of God, theft, mysterious disappearance or otherwise. Show, in its sole discretion, determines whether a prospective exhibitor is eligible to participate in the Show. Eligibility is generally limited to those who are in good standing with Show and current in payment of charges invoiced by Show. Show reserves the right to restrict or remove any exhibit which Show, in its sole discretion, believes is objectionable or inappropriate. You shall be solely responsible for obtaining any licenses, permits or approvals under federal, state or local law applicable to Your activities at the Show. You shall be solely responsible for obtaining any necessary tax identification numbers and permits and for paying all taxes, license fees, use fees, or other fees, charges, levies, or penalties that become due to any governmental authority in connection with its activities at the Show. SHOW DISCLAIMS ANY AND ALL WARRANTIES WHETHER EXPRESSED OR IMPLIED, INCLUDING, BUT NOT LIMITED TO, ANY IMPLIED WARRANTIES OF MERCHANTABILITY OR FITNESS FOR A PARTICULAR PURPOSE OR NON-INFRINGEMENT. SHOW MAKES NO REPRESENTATION OR WARRANTIES, EXPRESS OR IMPLIED, CONCERNING THE NUMBER OF PEOPLE OR EXHIBITORS WHO WILL ATTEND SHOW OR ANY OTHER ACTIVITIES OR FUNCTIONS OR ANY OTHER MATTERS. IN NO EVENT SHALL SHOW BE LIABLE FOR ANY INCIDENTAL, INDIRECT, SPECIAL, PUNITIVE OR CONSEQUENTIAL DAMAGES OF ANY KIND, INCLUDING, BUT NOT LIMITED TO, LOST REVENUE OR PROFITS REGARDLESS OF THE FORM OF ACTION WHETHER IN CONTRACT, TORT (INCLUDING NEGLIGENCE), OR OTHERWISE, EVEN IF SHOW HAS BEEN ADVISED OF THE POSSIBILITY OF SUCH DAMAGES. IN NO EVENT SHALL THE MAXIMUM LIABILITY OF SHOW EXCEED THE BOOTH FEES PAID. This Agreement shall be governed in accordance with the laws of Maryland without giving effect to any choice or conflicts of law. The parties agree to submit to the exclusive personal jurisdiction and venue of the state courts in Howard County, Maryland or the federal court in Baltimore, Maryland, for disputes relating to, or concerning this Agreement. Please sign using your mouse or using your finger on a touchpad or touchscreen.